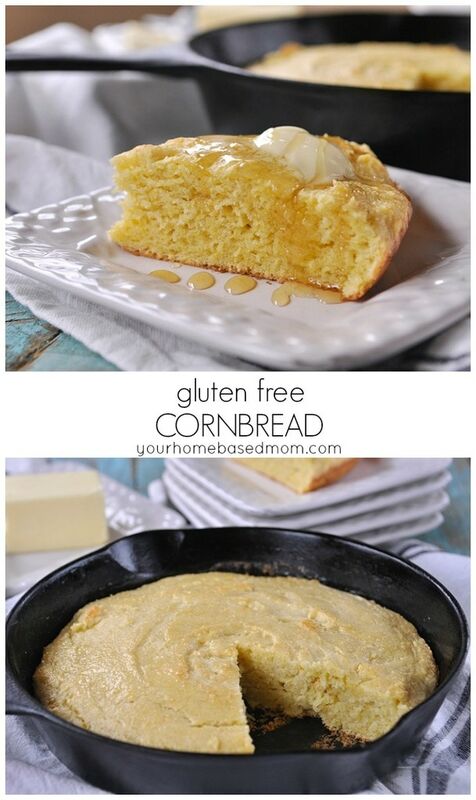 You’ll never know this is gluten free cornbread. Great texture and taste. 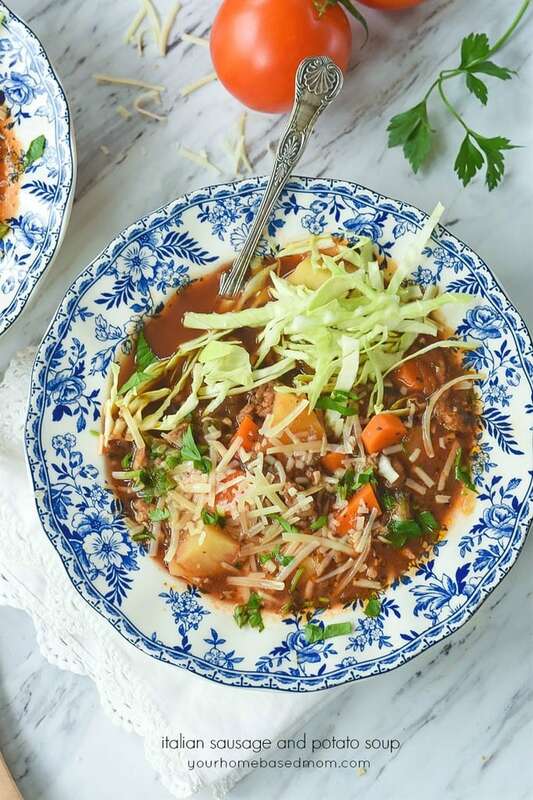 Yesterday I shared a yummy slow cooker double beef chili recipe with you. As far as I’m concerned you can’t serve chili without cornbread. 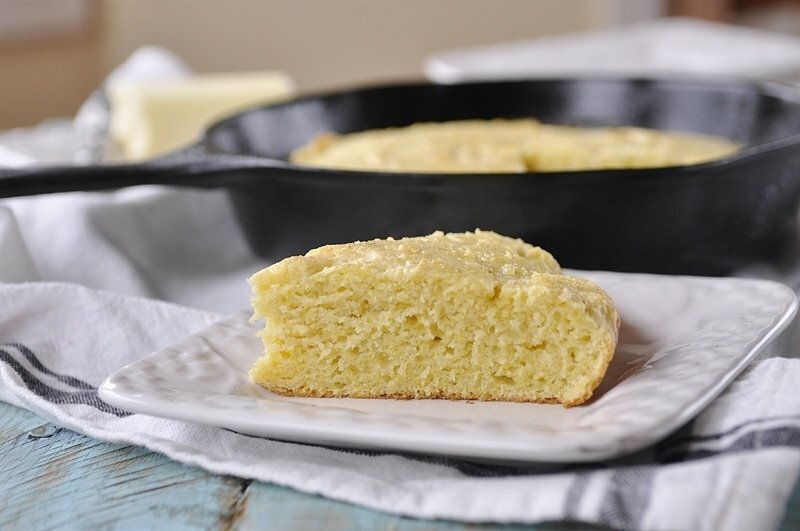 And at our house, cornbread must be made in a cast iron skillet! Of course, if you don’t have one you can make it in an 8 x 8 baking dish but I think things taste better when they’ve been cooked in cast iron and I just like the way the cast iron skillet looks on my table! Since my husband is gluten free I decided I needed to come up with a gluten free version. I experimented with three different recipes and finally found one we both liked. The other two ended up in the garbage. This recipe is not dairy free because it does have sour cream in it. 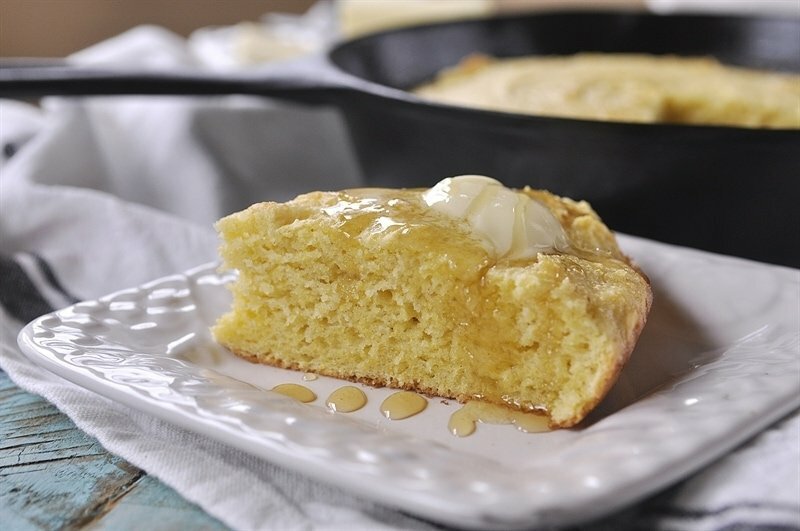 The sour cream helps make the cornbread not too dry which cornbread can have a tendency to be. 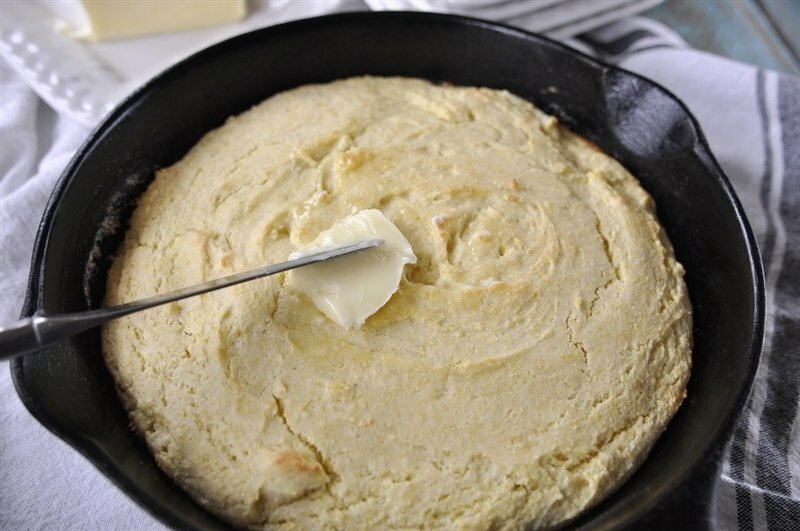 One thing I like to do after the cornbread is baked is to rub the top with some butter. It makes it look prettier and makes it less dry. As far as I’m concerned the only way to eat cornbread (besides with chili) is with butter and honey. 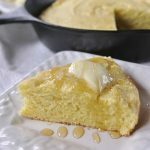 If just added a dollop of butter and then drizzled it with honey but if you’d like to make some yummy honey butter check out this recipe. I’ve also got some fun flavored honey butter recipes here. 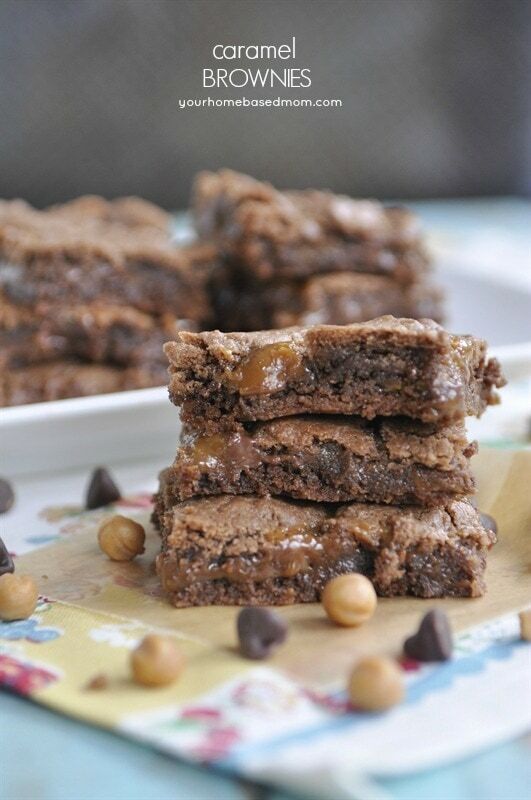 You can use your favorite gluten free flour mix. I’m a fan of theBob’s Red Mill 1 to 1 Gluten Free Baking Flour. They have lots of great gluten free products and it’s a local Portland business but their products are available in stores nationwide and online. The baked texture from this flour is great, none of that grittiness you get with a lot of gluten free flours. 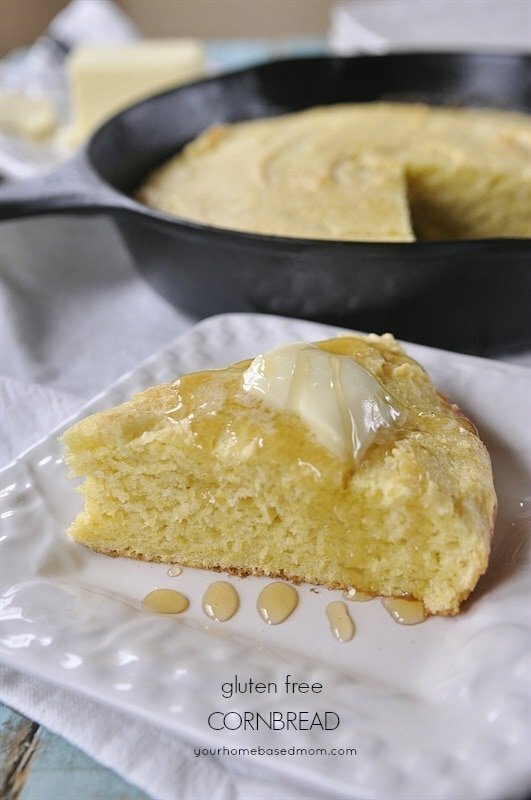 This gluten free cornbread is light and moist and especially yummy with honey butter. Your gluten free friends and family will thank you. To check out my favorite cast iron skillet go here. Mix together butter and sugar. Beat until creamy. Put batter into pan and bake for 18-22 minutes. Until golden brown and toothpick comes out clean. I made a pot of chili yesterday and was lamenting the fact that I couldn’t have any cornbread to go with it. My gluten free belly thanks you for this recipe! 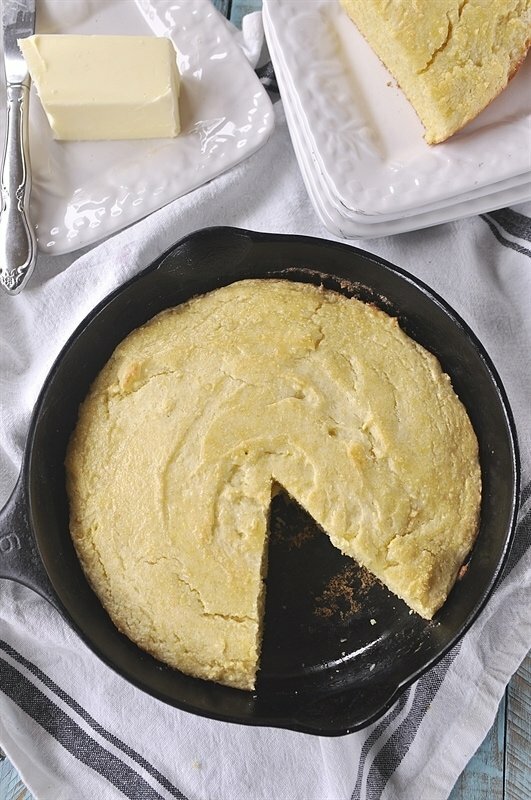 In the south we always make cornbread in a cast iron skillet but that is about all our recipe has in common. 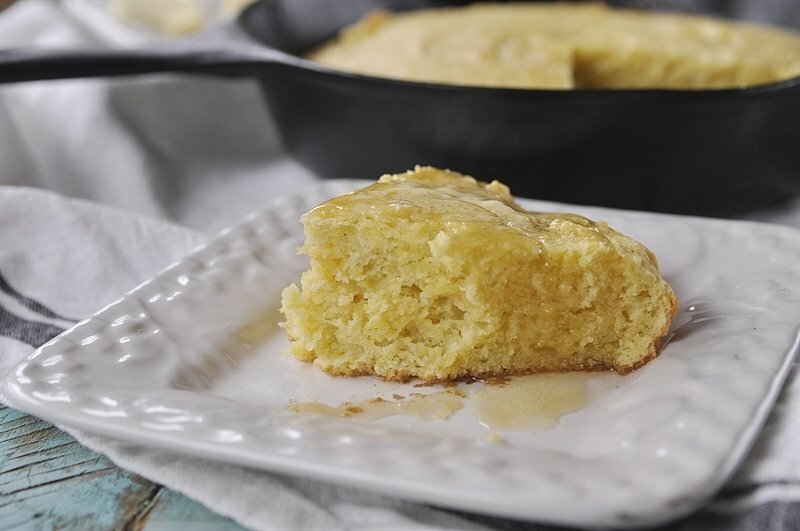 Our cornbread is all, or mostly, cornmeal with little or no flour added. No sugar at all. Legend has it that the Civil Was was fought because Yankees put sugar in their cornbread, but I wasn’t around then to verify this. Buttermilk, not sour cream, And the corn meal would be self rising, so no salt would be added. And most certainly no honey served with it. Ours is a rough delicious bread that is also good with chili. Your recipe would probably make a great breakfast muffin. 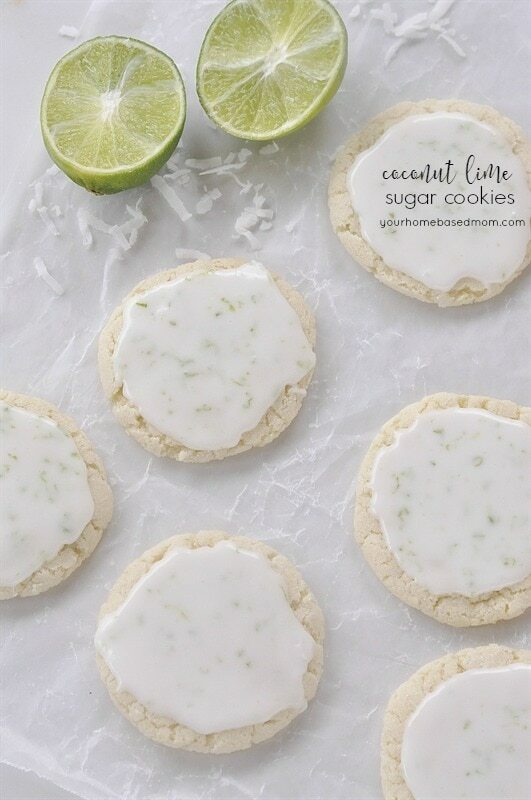 I love you and your recipes and look forward to your daily postings. Just thought I needed to let you know about my cornbread.